So many stripes and dots lately! I'm calling today's mani Pocket Change. I started with a white base of two coats of OPI Alpine Snow. 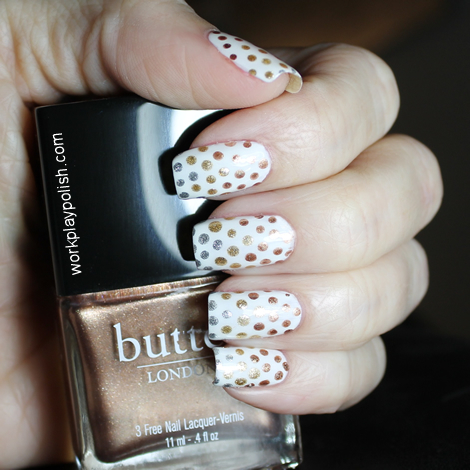 Then used a small dotting tool for the polka dot pattern. The bottom third of the nail is Butter London The Old Bill (bronze), the middle is Sally Hansen Golden and the tips are Sally Hansen Silver City. I dotted a few complete rows of The Old Bill, followed by an incomplete row (every other dot). Then I filled in the incomplete row with the Golden followed by a complete row, then a row of every other dot. And finally, I filled in the rest with Silver City. This gave the nails a pseudo gradient effect. It's hard to capture on camera, but this was really quite cool with three metallics on top of a creamy white base.